To deliver fully equipped soldiers in snowy conditions for the Swedish Army, Swedish firm Hägglunds came up with a vehicle that offered a low ground pressure so as to avoid sinking in snow. This was achieved by reducing the vehicles weight, (decreasing the armoured protection), and increasing the width of the tracks and the material they were manufacturer in (rubber). This goal was further achieved by dividing the vehicle into two separate sections, which in essence spreads the weight of a normal vehicles weight across two, and thus spreading the weight further, decreasing the ground pressure and creating a superior troop transporter for crossing artic conditions. The front section of the vehicle is where the driver and commander is located and a total of 6 troopers can embark. The rear section which is joined via an articulated link, is a more universal section. It can carry 11 troops and equipment or can adapted for other roles like mounting a mortar or ambulance. 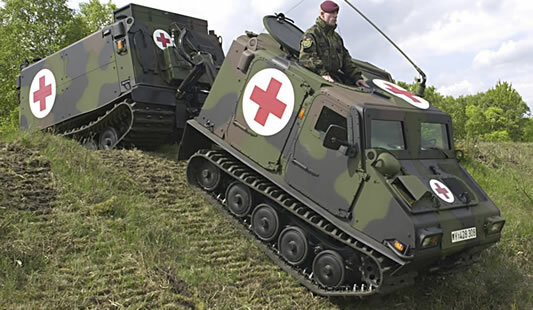 Bv 206A – The Bv206A is an ambulance version, which is capable of carrying stretchers in the rear compartment. Bv 206F – The BV206F is a fire appliance variant. PvBv 2062 – The PvBv 2062 is an open top version of the Bv 206 armed with a 90 mm Pvpj 1110 recoilless anti-tank gun. PvBv 2063 – The PvBv 2063 is similar to PvBv 2062 but fitted with the launch system for an ATGM, either the TOW (Rbs 55) or the Bofors BILL (Rbs 56). The Bv 206 is used in Antarctica, Brazil, Canada, Chile, China, Estonia, Finland, France, Germany, Lithuania, Latvia, Malaysia, Mexico, the Netherlands, Norway, Italy, Pakistan, Singapore, South Korea, Spain, Sweden, Ireland, the United Kingdom, and the United States. A total of 11000 BV 206 have been manufactured. The strong point of the Bv206 was its mobility. It offered no offensive capability, nor serious protection. The Bv206S was a new all welded super structure giving it a new shape and protection for the crew from MG fire and artillery shell splinters. A 7.62mm MG can be fitted on the front section of the vehicle. Driver and commander sit up front, with two passengers in the rear. The rear section of the vehicle carries 8 troops, 4 either side on benches in the rear section. The engine is a Steyr M16 6-cylinder 186hp diesel and is located in the front of the vehicle, much like a car. It can achieve a top road speed of 52km/h and an operational range of 300km. It can be equipped with various equipment and other roles other than troop transporter. It is in service with France, Germany, Italy, Spain and Sweden.